Our homestead permaculture project officially began this spring. I've been nibbling at the edges of the idea for some some now, primarily since reading Restoration Agriculture: Real World Permaculture for Farmers. I've always liked the idea of working with nature instead of battling against it, and Mark Shephard's comment (in Restoration Agriculture) that we really need to “stop trying to grow things that don’t want to grow and killing things that do want to grow” really struck a cord with me. When we were stuck in limbo not knowing if we were going to have to sell this place or not because August couldn't get a job closer to home (more on that on the About page), it didn't make sense to invest in long term plantings. Last year he finally got a new job back in the area, but the spring and summer were filled with moving, selling the condo where he'd been living, and adjusting to the new job. This year we're more settled, and the new job looks pretty stable, so it was time. We started pouring through the books and online reference materials, walking our land and looking at site overviews, and drew up a plan for the first series of earth moving and planting this spring. The plan will evolve over the coming years, but like any long term project, establishing a framework to build on is critical to success. Now that we've lived on our land for a while, we've gotten a much better feel for what works here and what doesn't, and our movement patterns around the home and homestead. We used the observations to help set up our goals. Create a series of windbreaks to develop protected microclimates. Plant or encourage the growth of crops that can be harvested for food, fodder, medicine and other uses. Develop habitat for pollinators and other wildlife. Promote soil building, general environmental health and water conservation. Work to extend the growing season. Add small livestock to work in combination with the plantings. Expand the variety of ecosystems by adding a pond. We have 35 acres out in the country, but 25 acres are rented to a neighboring organic farmer. Our home sits in an old abandoned pasture. Below is a topographic map of the area, with the 10 acres the homestead sits in to the right of the image. 00 – The human being, physical, mental, and spiritual: body, mind, self. This is the space you occupy every day. 00 – The home shelter; house and kitchen area especially. These are the space you occupy many times each day. In a well-designed homestead, this includes outdoor living space near dwelling. 1 – The most often used landscape areas: vegetable garden, barn, parking areas. 2 – Lesser-used areas that are frequented once to twice a day or so; typically, some staple annual crops such as potatoes; perennials, such as fruit trees and berries; grazing areas; mushroom yards. 3 – Areas frequented a few times a week: typically, grazing paddocks, most orchards, mushroom yards, and nutteries. 4 – The least frequented areas under management: woodlots, some grazing areas, some forest garden zones. 5 – Unmanaged land: “wild”. land that is left for observation alone – one visits but does not cut, harvest, or forage in any significant way. Not all or even most sites have a true zone 5. The north and west winds can be very strong, so the first thing we planted when we moved out here ten years ago was a windbreak of evergreen trees to the north and west. 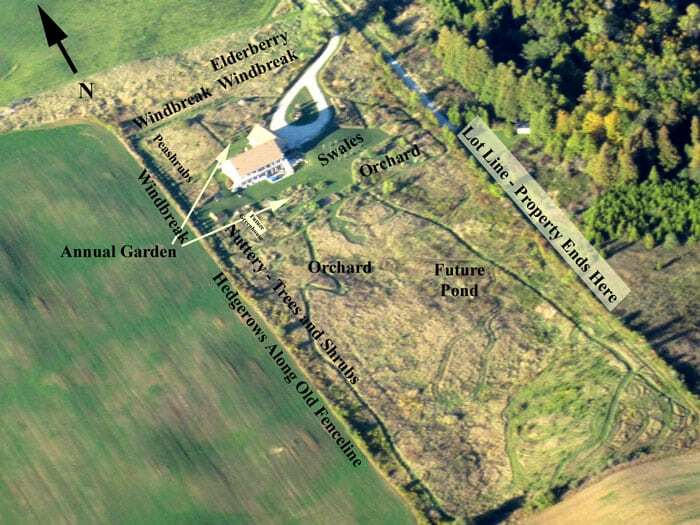 This year we added additional shrubs (Siberian peashrubs and elderberries) to double up protection to the northwest of the house and add protection to the east of the existing treeline where the land is lower and can be a bit wet at times. We have annually cultivated garden beds to the north and south of the house, and are in the process of putting up a greenhouse to the west of the main garden area to provide season extension and additional wind protection. There are additional patches of brambles, trees and shrubs for food production stretching out from the home. The whole system is knitted together by a series of mowed paths to make it easier to get from point A to point B. If you have specific questions about permaculture or our plans, I'd love to hear from you. Where is your farm located? I don’t want an address, just a general idea, like central Texas or upstate New York. Donna, I’m in northeast Wisconsin, and we have an annual solar open house the first weekend in October. I’m also considering a grounds tour/weed walk in July or August, since the plants are in much better shape at that point. Regarding the monarch butterfly that landed in front of you. I believe in spiritual happenings and right after my brother passed away, I started getting lots of black butterflies with blue on them. They would appear to me on a building on his birthday and other events. One landed in front of me and I reached down and picked it up, also thinking it was hurt. After a short time, it flew away, circled me once and then took off. I like to think it is my kind brother sending me love and letting me know he is in a better place. It’s been a long time now since we lost him, however, every so often, I still get black butterflies with blue on them and I say ” Love you” and his name. To me it is a reminder that he is in a better place. Enjoy your encounters with your butterflies as you may be getting a message from someone who has passed. Thank you for sharing your story. I’ve been doing a lot of emotional “house cleaning” lately, and I saw it as a sign that I’m heading in the right direction. I really enjoyed your post about the butterfly encounter. It is a blessing to be able to “engage” with God’s creation on such a level and is a reminder of the miraculous world we occupy. These days people miss so much because they are staring at their phones. )o8 This summer we have been rescuing turtles stranded on the streets or heading to perilous traffic. My grandson, who is four, has been with me almost each time and is now scouting out the roads as I drive along to watch for them. He is learning compassion, which is so important, and it’s always a good day when you rescue a turtle. It is a good day when you rescue a turtle, or help someone or some critter in need. 🙂 We had some of the boys’ cousins over a couple weeks ago, and they had never picked beans or eaten things straight from the garden, but they spent plenty of time on electronic gadgets. By the time they left they had a good dose of country, and seemed to enjoy it. 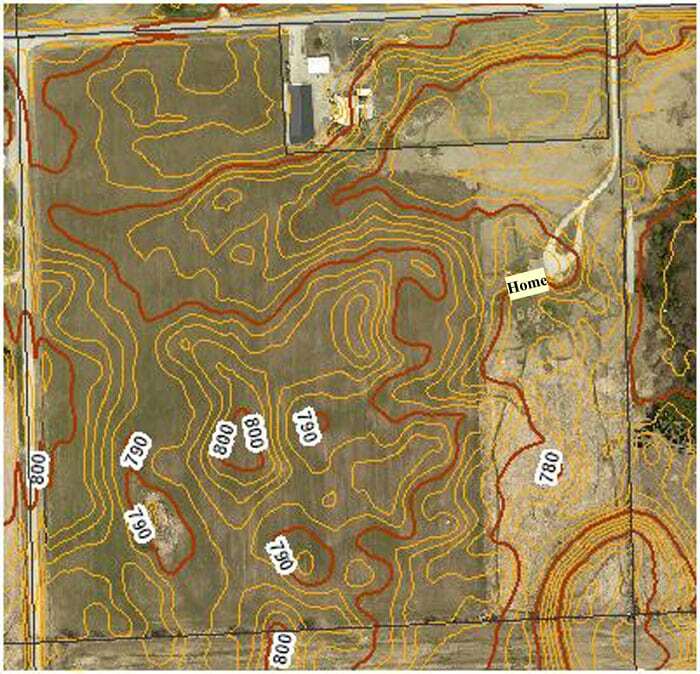 Where do you get your contour lines map for your property? I am looking for one for my property. We found local GIS maps online. 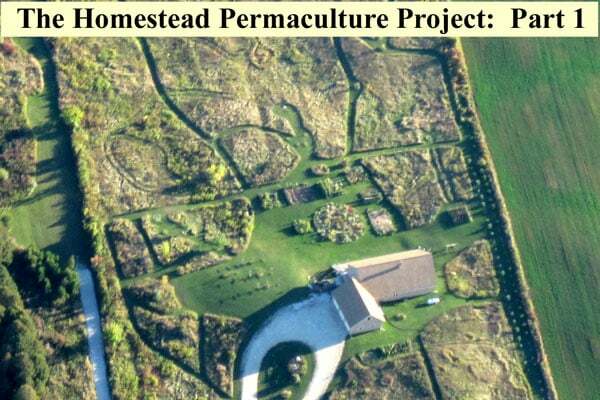 At my families home on Cape Cod, I’m attempting to start a permaculture design project. I have started a walled raised bed, but it sits on top of a leach field for our septic system. In the back of the house, which is only an 1/8 of an acre, there is a wetland that is going through succession. On the inside edges of our property, I’m going to start an food forest, and on the side of the house, we have an area that can support kugels that will be approximately 5 -10 feet wide by 30ft long. Please send info on guidelines that I can possible use to get this project underway. You may find the book “Edible Landscaping with a Permaculture Twist” helpful for designing your project.